Viral delivery of a three-transcription-factor cocktail has transformed pancreatic exocrine cells (blue) into scattered insulin-producing beta cells (red). A preexisting islet, or grouping of beta cells, is outlined at the upper left. The most stunning advance arose from diabetes research conducted by HSCI co-director Douglas Melton, Cabot professor of the natural sciences, and postdoctoral fellow Qiao “Joe” Zhou, who figured out how to transform one type of cell into another in a living animal by using a new process their research team has dubbed “direct reprogramming.” Specifically, Zhou and Melton created insulin-secreting pancreatic beta cells. But reprogramming holds promise, as well, for treating other diseases that involve missing cells, including cardiovascular and neurodegenerative conditions such as Parkinson’s disease and ALS (or Lou Gehrig’s disease). Unlike conventional stem-cell science, which involves using undifferentiated cells and then figuring out how to coax them to become a particular cell type, Melton and Zhou’s work points the way to a potential shortcut for treating any disease in which a cell type is missing. The trick was learning which genes to use. “The idea of reprogramming one differentiated cell type of adult tissue into another is very exciting, and it is applicable to achieve the regeneration of different types of cells in the body,” says Paola Arlotta, an assistant professor of surgery and of stem-cell and regenerative biology affiliated with Harvard’s new interschool department of stem-cell and regenerative biology (www.scrb.harvard.edu). Arlotta is performing related work to reprogram neurons of the central nervous system. Although different combinations of genes will be needed to cause reprogramming in different individual tissues, substantial progress toward their identification is now being made. Melton’s feat echoed that of Shinya Yamanaka of Kyoto University, who in 2006 employed viruses to reset adult cells to a primordial state. These induced pluripotent stem cells (iPS cells), as they are known, can in theory be prodded to differentiate into more specialized kinds of cells, but no one has figured out all the steps to do this yet. Melton’s simpler approach—directly changing one adult cell type into another—is the first method to achieve such success. Yamanaka’s technique also uses retroviruses that become permanently integrated into the genome and can induce cancer; the virus employed in Melton’s technique does neither. Melton nevertheless hopes to identify a drug that will mimic the action of the gene transcription factors he has identified as critical for pancreatic cell transformation. That would facilitate approval of potential treatments in humans, which could be as little as two to five years away. In announcing his discovery, Melton emphasized the importance of continuing to work with embryonic stem cells derived from fertilized human eggs because of the critical insights they continue to provide in the field of developmental biology, and with iPS cells, which were at the heart of some of the other Harvard advances this past summer. Two separate teams of HSCI researchers, employing variations of the Yamanaka technique, created disease-specific iPS stem-cell lines using adult cells from human patients. Kevin Eggan, an assistant professor of stem-cell and regenerative biology, announced in Science that he had used the technique to create motor neurons from the cells of an 82-year-old patient with ALS. George Daley, an associate professor of biological chemistry and molecular pharmacology and of pediatrics at Harvard Medical School (HMS), writing in Cell, announced that his laboratory had created 20 stem-cell lines representing a variety of afflictions, from “bubble-boy” disease to Parkinson’s. The iPS cell lines created by Eggan and Daley, made freely available to researchers throughout the world, will allow study of the development of these diseases in a petri dish, making them powerful tools for research even though they cannot be used in human therapy because of their cancer-causing potential. In the wake of these discoveries, HSCI announced that it would create a new “core laboratory” dedicated to iPS techniques, augmenting its four existing shared core facilities devoted to specialized aspects of stem-cell science. 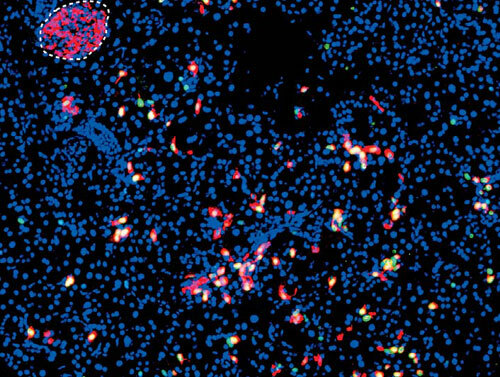 At the Harvard-affiliated Joslin Diabetes Center, the viability of using stem cells in clinical treatments was demonstrated in principle using mice carrying an induced form of muscular dystrophy. Amy Wagers, an HMS assistant professor of pathology, figured out a way to identify adult stem cells in muscle by means of the unique protein markers on their surfaces. She then transplanted stem cells from the muscles of healthy mice into mice with the disease. The stem cells not only restored partial muscle function, she reported, but also replenished the pool of stem cells that “could be reactivated to repair the muscle again during a second injury.” For now, the technique works only on a muscle-by-muscle basis, making it impractical for treatments, but the work proves the viability of stem-cell transplantation. The growth in stem-cell research at Harvard has been even more rapid than anticipated: a shared therapeutic screening facility designed to handle the work of HSCI researchers until the opening of the first science building in Allston three years from now is already operating at capacity. New courses are being offered this year through the department of stem-cell and regenerative biology, with plans to introduce a concentration in the 2009-2010 academic year. And the number of principal HSCI faculty members has increased from 40 a year ago to 65 this year (there are also a hundred affiliated faculty). Looking ahead, HSCI expects to fill the space allocated to stem-cell researchers in the new science building within the first two years of occupancy.